Biden says "literally" -- drink. Ryan brings up Bush -- two drinks! And if you're in NYC, come drink with us! Click here, or on the image below, to download our handy rule card. And if you want to join Pareene and other Salon staff in Brooklyn for our V.P. 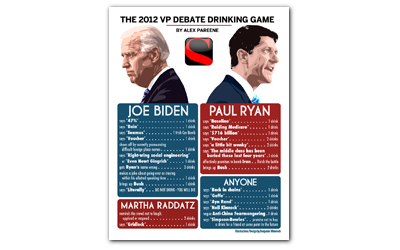 debate drinking-game party, email us with the subject line "VP debate." The first 30 or so responses will receive an email back with our secret location.